been denied for a generation. brought our nation to the brink of a dark abyss. This must end today." not the new Prime Minister's. fingers of her uplifted hand splayed outwards in an MDC salute. bankrupt Treasury would find the funds. democratisation, ending the humanitarian crisis and stabilising the economy. political detainees has become a litmus test of Mr Mugabe's true intentions. Government but last night they remained behind bars. His Excellency, Mr Morgan Tsvangirai. and compromise by all parties was a peaceful transition finally possible. the nation a new political dispensation. together, free from fear, hunger and poverty. nation to the brink of a dark abyss. seeking menial jobs, for which they are often overqualified but underpaid. flowers of our nation wilt and die. united by our respect for the rights and dignity of our fellow citizens. This is the Zimbabwe that I am working towards. To achieve this vision, my priorities are very clear. Firstly, we must implement our democratisation agenda. past that has so devastated our nation and our people. mortality level by tackling the causes of the epidemic. ensure that all those that are deserving can access the help they require. The third priority is to stabilise the economy. Out of the 20 fastest growing countries in the world, 15 are in Africa. Africa in 2009. As the world slows down, much of Africa is still growing. the skills and resources to contribute to this hopeful trend. best on the continent, can be restored to that standard of excellence. resources to prevent and treat disease. afford to eat, let alone pay for transport to their place of work. first address the urgent plight of our civil servants. are able to stabilise the economy. behind his or her desk on Monday providing service to Zimbabweans. between the party and the state. As your Prime Minister I will be open and honest with you. relationship that is not based on humanitarian assistance alone. your own, we will succeed. on this promising phase of our journey to a true and lasting democracy. prime minister, pledging to assist in the recovery of the country. him and his deputies," the EU said in a statement. contribute to the stabilisation and recovery of Zimbabwe. substantial and long humanitarian aid programme. rights, the rule of law and macroeconomic stabilisation." government for the next 12 months. West of trying to overthrow him. establish confidence in the rule of law in Zimbabwe." regional Southern Africa Development Community (SADC). going to remain in those dungeons any day or any week longer." fuel. The court deferred the matter to Friday. to be taken to hospital, but ignored by the authorities. the draconian Criminal Law (Codification and Reform) Act. 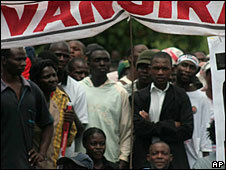 activists, despite clear evidence of the Mugabe regime's insincerity. Prison and other places of detention." political protagonists for political leverage." had to be lifted in order to allow the unity government a chance to succeed. targeted only specific individuals and companies shoring up Mugabe's regime. continue to provide humanitarian assistance. intention of really sharing power. their energies to rebuilding the country. school to be opened. Every civil servant must be on your desk this Monday,"
at a sports arena outside Harare city centre. they cannot afford bus fare on their paltry salaries. march forward as a united nation. learning from a sad past that has so devastated our nation and our people." still in captivity should be released. immediate needs of millions of hungry people. for the de-politicisation of food aid. coordinate food distribution with relief agencies. week was the worst outbreak of the killer disease in Africa in 15 years. stayed away from party politics. given deep-seated mistrust between Mugabe and Tsvangirai. 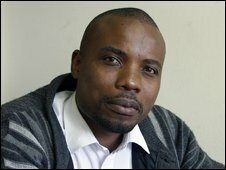 activist Fidelis Chiramba to a Harare hospital for medical examination. team of doctors to examine the two. should be kept at the hospital or returned to jail. them so they could receive proper treatment. people for military training in neighbouring Botswana to overthrow Mugabe. by the same security forces before assuming his new role. complement the team that he already had. be sworn in on Friday. prime ministers at State House on Wednesday. the task that lay ahead and was ready for the challenge. how the Zimbabwe justice system has not worked," said Majome. the bench is timid and malleable. ministers will be sworn in on Friday. MDC secretary general Tendai Biti. forthcoming as long as Gono remains at the helm of the central bank. Chanakira, the Kingdom Financial Holdings boss, for the central bank job. September 11 carnage on the Twin Towers in the US. number one enemy of this country, not inflation. "He has been stoking the fires of inflation through quasi-fiscal activities. ahead of Friday, when Biti takes the oath of office as Minister of Finance. consultation between the President and the Prime Minister. Mugabe unilaterally renewed Gono's mandate. the purpose on the Mt Pleasant campus. and now defunct international Bank of Credit and Commerce. Gono is also Mugabe's personal banker. shut down over one alleged mischief or other. owned by the governor and relieved him of 200 plumb birds. backdrop of unprecedented economic collapse sparked instant outrage. the MDC, a Reserve Bank governor is yet to be appointed." supposed "big boss" as he was just about to close business for the day. of a thief caught in the act. "There was nowhere to run because the shop was surrounded by armed police." International Airport in Johannesburg two weeks ago. himself for keeping the economy "afloat." at hand requires that any level-headed individual ignore such petty calls,"
he said in a front page story in an issue of The Sunday Mail. deal with one man. You deal with Gideon Gono." be an instrument of trade or store of value. for free to black resettled farmers just before the March elections. the first time Zanu-PF was defeated at the polls. historic loss in the March 2008 election, according to Biti. Command, whose meetings he has recently regularly attended. outrage from the Ndebele community. Friday. His line-up includes only one Ndebele official, Abednigo Bhebhe. after the announcement said they were not amused. presidium. He appointed Ms Thokozani Kuphe from Matabeleland as his deputy. Her predecessor Gibson Sibanda was also Ndebele. support for Tsvangirai's mainstream MDC party. the 2000 legislative polls, not in Mashonaland, but in Matabeleland. Matabeleland their fair slice of the cake by the Ndebele. now the man we thought would recognise us as a people, has left us out. Ndebeles are regarded as an underclass. "because of issuing inappropriate statements" to the press. should wait and see the final appointments." Foreign Affairs and Women' Affairs. 11am as Zimbabwe's Prime Minister. "But this is the greatest betrayal of all times by Tsvangirai," he said. then secretary general, Prof Welshman Ncube. Also named the MDC, the party established its headquarters in Bulawayo. newspaper world and joined the MDC. Mushonga-Misiharabwi is half-Ndebele on her mother's side. Bulawayo-based political party to electoral victory. suffered similar defeat in Chitungwiza in Mashonaland. Affairs to Sipepa Nkomo, which he declined. much baggage," the source said. Zanu-PF MPs in the House. them Ndebele. They sided with Tsvangirai and Moyo became the new Speaker. Bhebhe was one of the Mutambara rebels. Tsvangirai had not taken tribal affiliations into consideration. I am sure he is beyond that. Our people must get real." is debate for another day. political adversity, has been compelled to discard Marxist-Leninist dogma. pragmatism, commonsense and on the other, survival. fled totalitarian Soviet Russia to America. stood against their odious policies. losing control of his political destiny'. President Mugabe has succumbed to the dictates of demand and supply. pronouncements will make President Mugabe's transfiguration less arduous. a polished profile on the fiscal and monetary podium. devil incarnate, responsible for the current economic global catastrophe. backstage of the biggest capitalist economy in the world. and gross exploitation of the worker by a heartless few. quick to subjugate human emotion to the whims of commerce and industry. at the forefront in the battle against unjust corporatist profiteering'. fortunes of Zimbabwe around. It is their only chance for national atonement. new update released by the World Health Organisation has stated. forcing residents to use water from streams and lakes. minor repairs to get them working again. may be contributing to infection." "long-term preventive measures, especially water and sanitation programmes". between President Robert Mugabe and Prime Minister Morgan Tsvangirai. long-awaited national unity government due Friday. cholera epidemic that is still spreading and claiming lives. brought our nation to the brink of a dark abyss. This must end today," Mr.
Zimbabwe that I am working towards," he said. presidential run-off in which Mr. Mugabe was unopposed following Mr.
"our values are stronger than the threat of violence." and policemen - will be paid in hard currency beginning next month. Mr.
sufficient foreign exchange to fulfill that pledge. resourceful," he said. "By uniting as a nation and a people we can succeed. with your own, we will succeed." democratic struggle and the new government will change little. oversight of the national police, with a ZANU-PF counterpart. working towards since its founding in 1999.
arrangement as the only way forward for the country. against President Robert Mugabe and key his associates will remain in place. we see effective governance in the country and that is going to be key." power-sharing" on the part of Mr. Mugabe. stalled over the distribution of cabinet posts. skeptical about Mr. Mugabe's intentions. a new government under Morgan Tsvangirai. government with long-time rival President Robert Mugabe. Mugabe to walk off the stage," he told ABC Radio. but no consideration was being given to lifting sanctions. "They will remain for the present," Mr Smith said. economic and health challenges facing the impoverished country. the people need an improvement in their humanitarian and economic state." implementation of a September power-sharing accord. the path of democracy and respect for human rights." lack of clean water, and around 7 million cannot adequately feed themselves. Corporation was in dire need of medical attention. practitioner for an independent opinion on Mukoko's condition. Schools shut down in shattered Zimbabwe - U.
Zimbabwe's education is a "national disaster" with some 94 percent of rural schools now shut because teachers can no longer afford to work, the U.N. children's agency says. UNICEF called on the country's new government to take drastic action to get children back in class as opposition leader Morgan Tsvangirai was sworn in as prime minister on Wednesday under a power-sharing deal with President Robert Mugabe. Less than a decade ago Zimbabwe had the best education system in sub-Saharan Africa with nearly every child going to school, but attendance has fallen to just 20 percent and is likely to drop further, according to aid workers. "The education situation is a national disaster. It is imperative that the unity government focuses on this," said UNICEF's representative in Zimbabwe, Roeland Monasch. Aid workers warned that depriving millions of children of their education not only jeopardised their own prospects but those of the country, which is in economic meltdown and stuggling with galloping inflation, a major food crisis and massive cholera epidemic. "A generation is at risk of growing up without any education in Zimbabwe, and that will have catastrophic consequences for the country's recovery," Save the Children's Rachel Pounds said. Aid agencies say one of the main reasons for the school closures is that teachers simply cannot afford to turn up. A teacher's monthly salary is only enough to buy a few loaves of bread, according to Save the Children. And raging inflation mean it's decreasing every day. Teachers earn so little that they are forced to spend their time scraping together enough to live on by any other means they can. UNICEF released its figures on school closures following a survey which revealed 66 of 70 schools visited were abandoned. Only one school was fully operational and only a third of pupils there were in class. "Children in rural areas already live on the margins," Monasch said. "Many are orphaned, a huge number depend on food aid, they struggle on numerous fronts. Now these children are being denied the only basic right that can better their prospects. It is unacceptable." In many cases hunger is forcing parents to keep their children out of school to help earn money or scavenge for food. Around half Zimbabwe's 12 million population now needs food aid. UNICEF said school term only resumed this year in some urban areas for the few who could afford to subsidise teachers' salaries and pay exorbitant U.S. dollar fees. Meanwhile, Save the Children has warned that those schools still open could become deadly breeding grounds for cholera because of their lack of clean water and sanitation. Roselyn Hanzi and Tawanda Zhuwarara have also been charged. but this is small comfort as they will spend a second night in filthy cells. removed them to Harare Central police station. to their clients and barring them from taking proper instructions. return to the rule of law and respect for the Constitution of Zimbabwe. condemned in the strongest of terms. are made to answer for their unlawful actions. implement a new progressive order in Zimbabwean politics. abuses by the state cannot, should not be left to political processes alone. secrecy that surrounds Gukurahundi and other human rights abuses. their ordeal must be one of its first actions, followed by a TJHC. uphold the outcome of the ballot. collapse of the water infrastructure has claimed thousands of lives. until he shows that he is able to wield real power. before eventually becoming a powerless vice-president in a one-party state. persecution at the hands of a government led by black Africans." may come to rue the day he did a deal with Mugabe. a citizen will be respected. who lost elections but shamelessly clung to power. sharing deal which leaves them in control. recommend Thabo Mbeki for a Nobel Peace Prize. tenets of democracy. It amplifies the poverty of African politics. that those who lose elections should simply hand over to the victors? serious about democracy, he should be history by now. before taking any oath is equally nerve wracking. defective system they sought to reform or being ruthlessly eliminated. and does not inspire confidence. via the backdoor of defective power sharing deals. fails to deliver without the international aid required. Mugabe for some time. I am depressed. Two supporters of Zimbabwe's Movement for Democratic Change (MDC) party - with very different outlooks - tell the BBC how they felt as their leader Morgan Tsvangirai was sworn in as prime minister. I don't hold much hope that this unity government will be able to bring change to Zimbabwe. 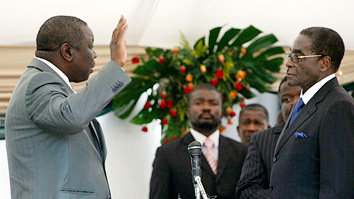 I really didn't feel comfortable watching Tsvangirai being sworn in by [President] Robert Mugabe. MDC supporters I spoke to this morning had hoped this would be a proper inauguration for Morgan Tsvangirai, with the chief justice swearing him in. Instead it's Mugabe leading the ceremony, showing he is still in charge. By insisting on this, Mugabe is belittling Tsvangirai. It underlines the fact that the MDC's objective of complete change has not been met. I am part of a grassroot movement campaigning for a new constitution, written by the people of Zimbabwe. There needs to be free political activity in this country in order to change the constitution, and I don't see it happening even with this new government. The crucial ministries, agriculture and mining, the ones that have the power to make changes in people's lives, have gone to [Mr Mugabe's] Zanu-PF. With a MDC man as finance minister [Tendai Biti], Zimbabwe's economic policies might change, but overall things won't depart much from Zanu's way of thinking. When I voted for the MDC in the elections last year, my belief was that I was voting for total change. But with Tsvangirai's team joining Zanu-PF we are seeing a compromise instead. This is not necessarily a new beginning. It's a case of blending the old order with a few elements from the MDC. I don't want to be a prophet of doom, but I really don't think my living standards will improve in the next year with this new government. I was in the stadium audience watching this ceremony and I felt very emotional. It reminded me of the swearing in of Barack Obama [in America]. I'm optimistic Morgan Tsvangirai will lead Zimbabwe into a new future. I was touched by the Tsvangirai speech. I am happy. The thing is, Tsvangirai can't continue watching the football match being played from the sidelines. He has to take part in the game himself now. Mugabe is our ruler but Tsvangirai is our real leader. A woman next to me was crying. I did not cry because I felt there is now a future for me. I'm divorced and because of the economic situation I can't see my children. But I think this new government will improve the economy and so enable me to visit them. Because of the economy lots of marriages have broken down. I think change is coming. I noticed today even that the police's behaviour is changing. MORGAN TSVANGIRAI, the leader of Zimbabwe’s opposition party, has taken a brave step. On Wednesday February 11th, more than ten months after success for his Movement for Democratic Change (MDC) in the first round of presidential and parliamentary elections, Mr Tsvangirai became prime minister. In theory at least, he will share power with the man who swore him into office: President Robert Mugabe, who has ruled Zimbabwe since 1980. The deal to share office was brokered by Zimbabwe’s neighbours. Up until the last moment, there had been doubts as to whether Mr Tsvangirai would agree to enter the new “unity” government. He had set several conditions for his participation, including the release of MDC and human-rights activists who had been abducted, tortured and detained for months by government security forces on largely trumped-up charges. None has been set free. In the end, and under some pressure, he appears to have felt that a bad deal was better for his wretched compatriots than no deal at all. Zimbabwe, once one of the most prosperous countries in Africa, is in a dire state. Millions now depend on food aid; many are starving. A spreading cholera epidemic has killed over 3,300 so far, with nearly 70,000 infected. Health, sanitation and education systems are all in a state of collapse. Hyperinflation is running at unimaginable levels. The central bank has now agreed to allow foreign currencies to be accepted as legal tender alongside the local (near worthless) Zimbabwe dollar. But this will only make life more difficult for those without access to the American dollar or South African rand. All these troubles now fall on Mr Tsvangirai’s plate. Even though the MDC won 100 parliamentary seats in the elections last March—one more than Mr Mugabe’s party—it has been allocated only 13 of the 31 ministries in the new government. Mr Mugabe's Zanu-PF gets 15, with the remaining three going to another small opposition party led by Arthur Mutambara, which holds just ten parliamentary seats. Responsibility for the hotly contested home-affairs ministry, which oversees the police, is to be split between Zanu-PF and the MDC. Mr Mugabe remains in control of the armed forces. Tendai Biti, a fiery human-rights lawyer and the reputed brains behind the MDC, has been given the unenviable post of finance minister. The whole shaky set-up is to be monitored by a joint 12-member committee comprising four senior officials from each of the three parties. It is supposed to check compliance with what has been agreed and to seek to resolve any disputes. If it cannot, the disputes are to be referred first to the Southern African Development Community (SADC), a 15-member regional group which, after months of deadlock, succeeded in ramming the deal through on January 28th. If it fails, the matter will be referred to the African Union. Many fear that the MDC leader will simply be used by Mr Mugabe as a scapegoat for the country’s seemingly insuperable ills, leaving the wily president, who turns 85 next week, in control of all the levers of real power. Ominously, the president is apparently free to fire his prime minister at any time for alleged incompetence, real or imagined. South Africa’s president, Kgalema Montlanthe, has hailed the deal as a vindication of his country’s much-criticised approach of “quiet diplomacy” to the ongoing crisis, calling on the rest of the world to come to the aid of Zimbabweans. But scepticism is understandable. Both the United States and Britain have indicated that they will wait to see how the unity government performs before removing sanctions against Mr Mugabe and his allies in or resuming aid. 2,000 bottles of champagne and 8,000 lobsters - while his people starve. champagne to be Moet & Chandon or 1961 Bollinger. even that hard to come by. charities that are struggling to ease Zimbabwe's humanitarian crisis. The cost of one lobster could feed a family of five for a week. would save the lives of millions. feeding centre for a week.